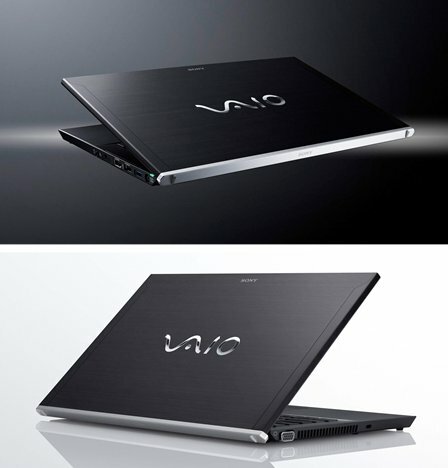 Sony rolls out the VAIO VPCZ21V9E, a new 13.3" laptop with a carbon fiber body. It weighs just 1.18kg and features the Intel Core i7-2620M 2.70GHz processor, integrated graphics, 8GB DDR3-1333, 256GB SSD (RAID 0), Windows 7 Professional, 802.11a/b/g/n WiFi, 3G WWAN, Bluetooth 2.1+EDR, HDMI, HD webcam, and a fingerprint sensor. One of the special features is the optional Power Media Dock VGP-PRZ20C/VGP-PRZ20A, this multimedia add-on connects to the laptop via Intel's Light Peak technology and delivers AMD Radeon HD 6650M graphics, a DVD burner (VGP-PRZ20C) or Blu-ray drive (VGP-PRZ20A) and some additional outputs. Weighing little over a kilogram, the new VAIO Z Series notebook PC from Sony is created for mobile professionals who demand absolute performance and portability. VAIO Z blends ultra-desirable styling and premium carbon fibre with no-compromise specifications and innovative productivity features. In the office or on the road, this class-leading business notebook helps demanding users work more efficiently with the ultimate in on-the-move computing power. All-new VAIO Z takes cutting-edge styling by Sony to new extremes, with a ‘full flat’ body and display lid that are crafted in tough, ultra-light carbon fibre. At just below 1.2kg and 16.65mm slim, the new VAIO Z is the perfect partner for business travellers who demand ultimate power with less to carry. On-the-go usability is enhanced further by the backlit keyboard with extra-wide palm rest and ergonomic new ‘button-less’ touchpad. With a resolution of 1600x900, the 33.2cm (13.1”) VAIO Display Premium features an anti-reflective coating that cuts glare from direct light sources and ensures crisp colour reproduction. Performance is everything you’d expect from the most sophisticated VAIO notebook yet. Latest-generation standard voltage Intel® Core™ i7 processors are teamed with speedy DDR3 SDRAM and up to 256GB SSD RAID storage to blaze through the toughest workload with ease. As an extra refinement, Quick Boot saves precious time when you’re in a hurry, loading Genuine Windows® 7 Professional up to 50% quicker than conventional notebooks. Embedded VAIO 'everywair' 3G WWAN on selected models connects via your mobile broadband operator. The performance of VAIO Z Series is taken to new extremes by the unique Power Media Dock2, a monolithic expansion module that links with VAIO via an optical cable. The proprietary port can also be used to attach regular USB devices to VAIO when it’s not docked. Featuring high-speed I/O data transfer based on the architecture codenamed ‘Light Peak’, Power Media Dock boosts graphics performance while adding numerous extra connectivity options. It includes an optical drive for even greater business productivity and satisfying HD entertainment. The module comes supplied with a stylish design-matched stand. With Power Media Dock added, VAIO Z can manage up to four displays (including the notebook screen) via HDMI™ and/or VGA output ports. In this configuration, VAIO Z makes a compelling choice for design, finance and science professionals who need to work across several screens simultaneously. New-generation AMD Radeon HD graphics with 1GB VRAM effortlessly handle demanding graphics tasks, from 3D CAD to gaming. When docked, connectivity options are boosted by additional USB ports plus VGA and HDMI outputs. Power Media Dock also sports an optical drive bay that can be specified with a Blu-ray Disc™ or SuperMulti combo drive. Games and movies on DVD or Blu-ray Disc sound as good as they look with latest Dolby® Home Theater® v4. VAIO Z features the innovative ‘sheet battery’ already showcased on this year’s VAIO S Series. The notebook’s internal lithium polymer battery provides power for up to 7 hours1 on-the-go computing. It’s partnered by a second thin, flat optional lithium polymer sheet battery that can be charged separately from the PC and added without removing the internal battery. The sheet battery attaches without having to switch off the PC, boosting stamina to up to 14 hours1 for day-and-night working, even if you’re far from mains power. VAIO Z delivers a richer communication experience if you’re staying in touch with colleagues via video conference or web chat. The HD web camera powered by Exmor™ technology ensures detailed-packed video even in low light. There’s a full range of official accessories from Sony, style-matched to complement the looks and performance of your VAIO. Many more configuration options – including a Full HD (1920 x 1080) LCD – are available exclusively to online shoppers at Sony Store. 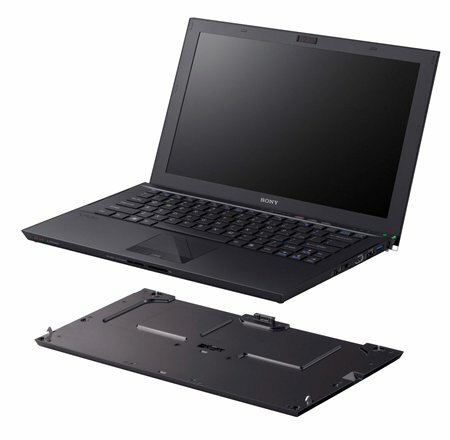 The new 2011 VAIO Z Series of ultra-portable performance notebook PCs is available from the end of July 2011 (actual date of availability varies by country).